Home :: Canada :: Newfoundland :: Newfoundland 1932 5c. Maroon Imperforate Pair Stamps. SG225ca. Unmounted Mint 1932 5c. Maroon Imperforate Pair Stamps. SG225ca. Imperf. 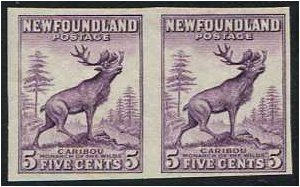 Pair of stamps with Caribou design.